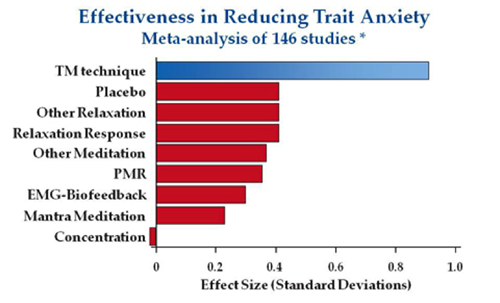 A meta-analysis of 146 studies on trait anxiety conducted at Stanford University found that the Transcendental Meditation® technique is the most effective meditation for decreasing chronic anxiety. 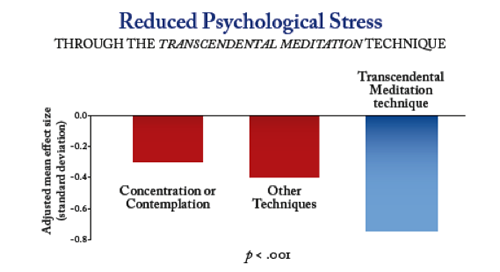 The Transcendental Meditation technique reduces anxiety that has become a trait twice as much as other methods. Reference: Eppley, K., Abrams, A., Shear, J. (1989). Differential effects of relaxation techniques on trait anxiety: a meta-analysis. Journal of Clinical Psychology, 45(6):957-974. A meta-analysis of all high-quality studies on the effects of stress-reduction techniques on reducing blood pressure in patients with hypertension found that only the Transcendental Meditation technique significantly reduced blood pressure.